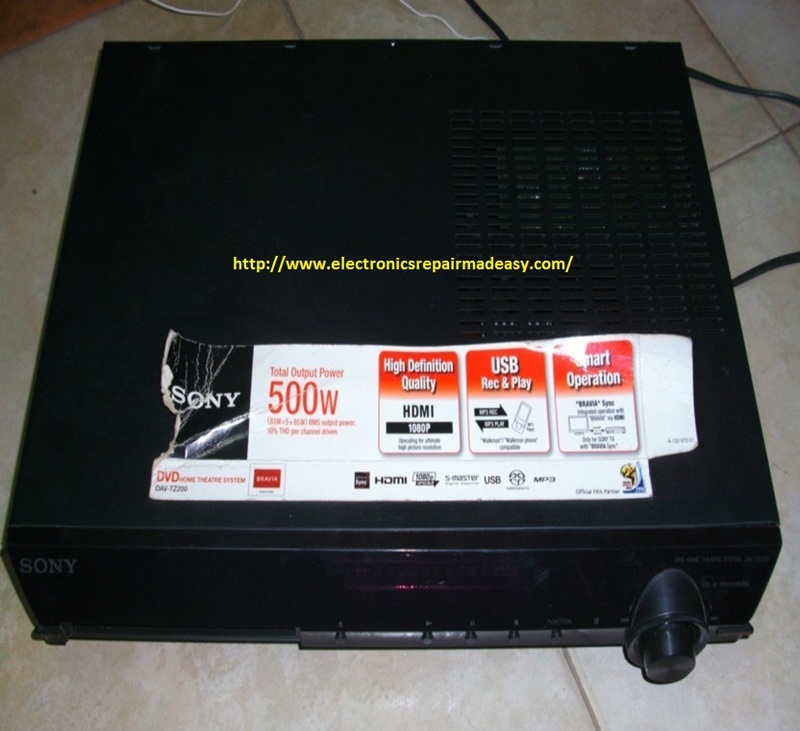 electronics repair made easy: Sony DVD model DAV-TZ200 Home theatre system “no disc” symptoms repaired. Sony DVD model DAV-TZ200 Home theatre system “no disc” symptoms repaired. A friend of mine brought to me his home theatre to me to check it out, the initial complaint was that it was not able to read disc. I pressed the eject disc button and the tray was not opening. 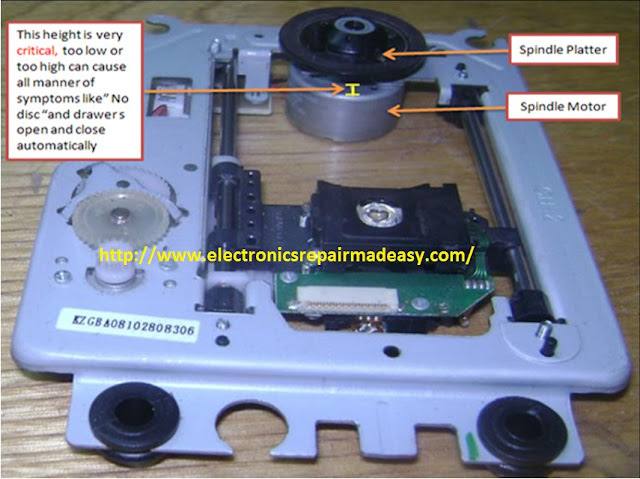 May I point out here that sometimes if the spindle motor is shorted it can load down the supply such that even the drawers are not able to open…This gave me a clue that the spindle motor may be shorted even before I opened the machine. I pulled my best friend analogue meter to confirm if the spindle motor is shorted or not and true the spindle motor was gone. I pulled one from my drawer (I always keep several pieces because this motor has a high failure rate and replaced the faulty one). 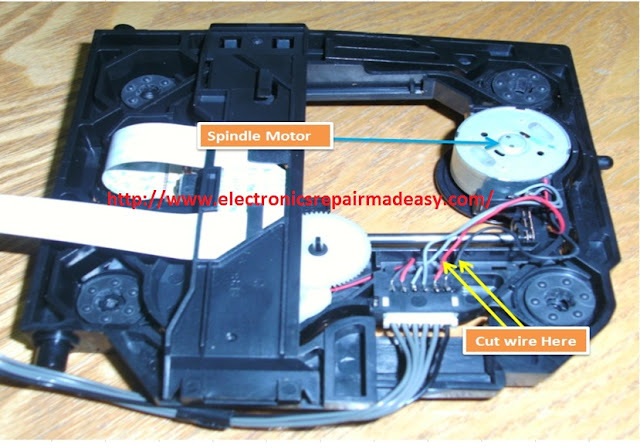 Because the polarity of the wires were not marked on the board I decided to cut the two wires to the spindle motor one inch from the board so that I won’t have problems to figure out which wire is which when replacing them. Please note that I have seen a DVD player brought to me with “No Disc” symptoms and I traced the problem was the spindle motor was replaced with a good one but the technician inter changed the positive (+) and negative (-) wires and therefore the disc was spinning at normal speed (500RPM) but in the opposite direction and hence the tech never solved the problem. After replacing the spindle motor with a new one which my meter has also confirmed to me that it is okay, the home theatre developed another problem. The drawers were closing and opening throughout. So I tried to figure out what could have gone wrong while replacing the motor. 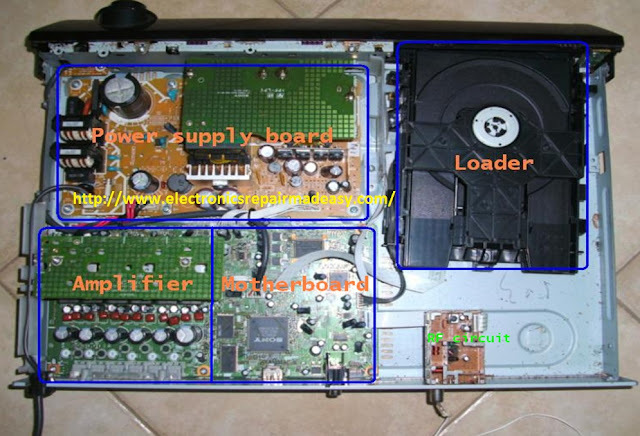 After a lot of mind searching, I started to observe the behavior of the disc (movement in and out with the top cover of the home theatre removed. I noticed the platter height was quite high and the disc was not loading smoothly. To solve this problem of the height I had to use the platter from the previous motor and that solved the height problem and the home theatre DVD module started working again. Advice. Please note that whenever changing the spindle motor be sure to note the height of the platter (table) from the spindle motor body because this is very critical otherwise you may solve a problem and create another and end up not repairing the machine. I have Dapic Divx S-3885 Model its audio is Ok. But, No Video it is shows No signal. what will be the Problem. I was checked the voltage checking all are perfect. please help me what to do....?